Microsoft Project is one of the oldest project management software species that not only managed to survive but to keep the leading position on the market through constant evolution. With first commercial version released for DOS in 1984, Microsoft’s latest version MS Project was released in 2010 along with the upgraded MS Office 2010, both featuring the Fluent User Interface (also known as the Ribbon). The application is available in Standard, Professional and Microsoft Project Server editions. MS Project is branded as Microsoft Office product, yet it is sold separately, not being included in the Office suite. Microsoft Project helps project managers develop the project plans, assign resources to tasks, and do the budgeting, workload analysis and progress tracking. You can build critical path schedules, resource-level the schedules and build Gantt charts to visualize them. The application supports third-party add-ons to extend the process management functionality to the maximum. Users may have various access levels to the project data, custom elements like tables, views and calendars can be shared among users, shared in an enterprise global. The latest MS Project release is focused on ease of use for newbies, user-friendly planning and reporting. Easy to Get Started. The Fluent User Interface (aka “Ribbon”) from the last Microsoft Office release is used in MS Projects, it brings up the frequently used commands, making them easy to find for the newbie. The copy-paste functionality now fully supports inserting bulleting lists, preserving the formatting and hierarchy of the pasted elements. Easy to Plan. In addition to automatically scheduled tasks that were present in previous releases, Microsoft added the Manually Scheduled Tasks (aka User-Controlled Scheduling). These tasks may have no-durations or dates if you do not have this information on the task available. These tasks may not be moved without user’s permission, yet the application will give you a warning once the potential scheduling issues are to appear soon. The Team Planner view was added. 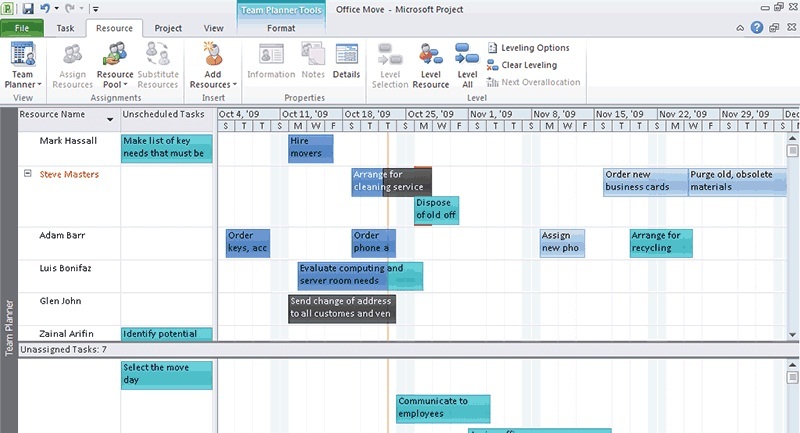 It is a resource Gantt chart that displays how the work of the project team is laid out over time. This helps quickly detect the problems and resolve them. Easy to Report. The Timeline View was added to help summarize the project quicker. The time-line can be shared in other Microsoft Office applications like PowerPoint. Another useful feature is fully functional task Sync to SharePoint and back. This helps to collect the updates from the team members.